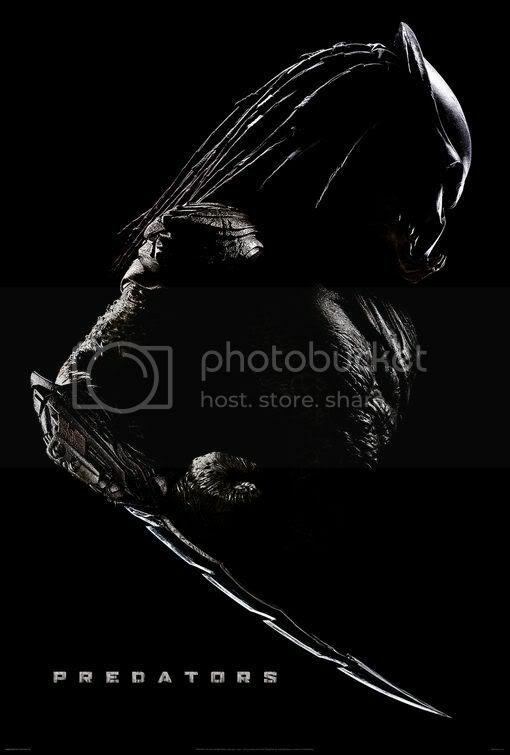 One mustn’t expect a great deal going into a film titled Predators. The name is a sign of its throwback cheesiness, a reminder of past 1980’s action films like its namesake, Predator. The plot is even sillier than the title, and in a self-aware cheesy film this wouldn’t normally be a problem. Predators, unfortunately, so relentlessly treats its silliness in such a serious manner that it occasionally crosses the line into dullness. One might recall that in Arnold Schwarzenegger’s 1987 original there was a creature from a distant planet, one that pursued its victims with an intense zeal. Its goal in life was merely to hunt, to kill creatures and take pleasure from the hunt and the kill. 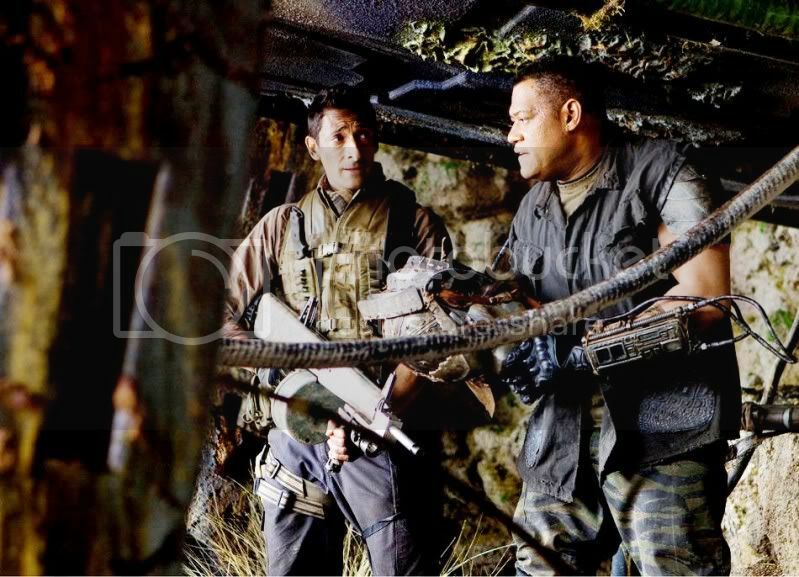 In Predators the scenario is reversed: instead of a small band of humans on earth hunted by one predator, there is a small band of humans on a foreign planet hunted by a pack of predators. The film opens in an entertaining fashion, with Adrien Brody’s mercenary character free-falling into a lush planet surface. His chute opens at the last second and he survives the fall. Soon other bodies are splatting into the ground, most surviving the impact while a less fortunate one or two find their chutes less reliable than they might have hoped. The men (and woman) are well-armed, and all seem to have been terrible killers on earth. There is a person from each hot-spot on the planet. 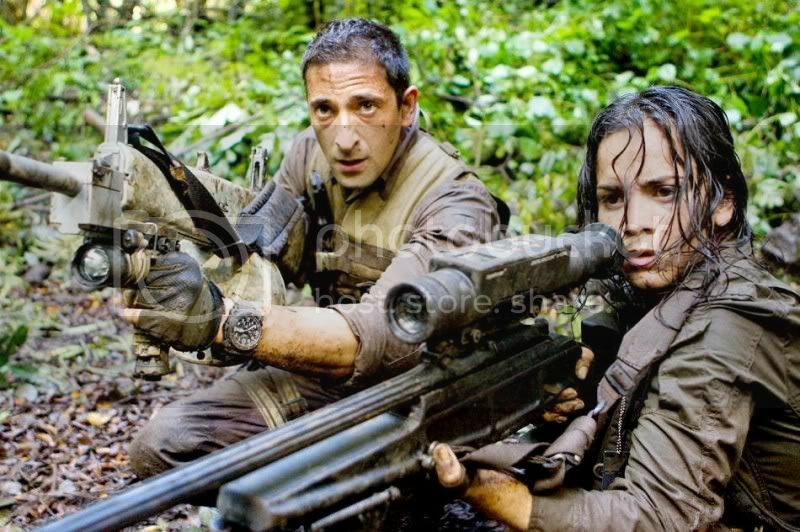 Isabelle (City of God’s Alice Braga) is a trained South American sniper. Hanzo (Louis Ozawa Changchien) is a silent Yakuza gangster with deadly skills. Cuchillo (Danny Trejo) is a Mexican gangster sporting dual uzis. 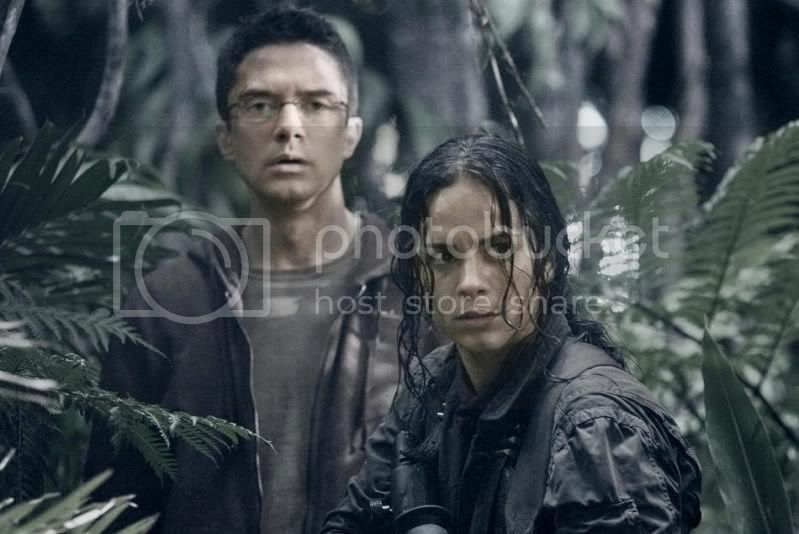 And then there’s Edwin (Topher Grace), a bespectacled nerd who can barely run away to save his life. His presence is all the more odd given his apparent lack of murderous skills. Adrien Brody’s mercenary (his name is saved until near the end of the film, so I wouldn’t want to spoil it here) rounds up the troops and leads them through a jungle that no one recognizes. However, it isn’t until they break into the open and spot numerous other planets orbiting in close proximity that they realize they are no longer on planet Earth. As they march they encounter a variety of increasingly deadly obstacles. Giant spiked dog creatures, ripped directly from Avatar’s [review here] Pandora, attack them but are recalled by a mysterious whistle before too many characters die. Soon they realize that some form of deadly creature is slowly, inexorably hunting them, but it isn’t until they encounter a rotund survivor *spoiler* named Noland (Laurence Fishburne) that they realize they are in the middle of a grand plan executed by a race of incredibly advanced hunters. The first time a predator is clearly visible it is striking, a weirdly fleshy abomination that could conjure legitimate terror in the audience. Soon, however, there are numerous shots of armor-clad predators, each one looking more like the titular Creature from the Black Lagoon than the epitome of violent evolution. It is unfortunate that the creatures alternately look frightfully warlike and cheesily costumed, particularly when the rest of the film succeeds in capturing an atmospheric jungle aesthetic. Being a strange planet, there are a number of other environments that the filmmakers feel free to exploit. Each is adequately inspired by classic science fiction, even the enormous spaceships in which Noland has fortified himself. Noland’s appearance is one of the greatest moments in the film, particularly when the realization dawns that this is Laurence Fishburne. It becomes increasingly implausible, however, as it becomes clear that he has survived several hunting seasons on the planet and still looks nearly as well fed as a man with a lifetime invitation to an all-you-can-eat buffet. This is just one of the many implausible scenarios presented by the film, but if one is hoping to nitpick a film they probably should not be watching Predators in the first place. Topher Grace provides the most laughs, if only because his appearance is so highly incongruous. Unfortunately, the eventual exposition regarding his choice as one of Earth’s elite killers is inadequate, leaving the viewer hoping for just a little more. There are a couple interesting elements in the film outside of the basic struggle between humans and predators. The idea that Earth’s most experienced killers have been grouped together is interesting, particularly when Isabelle notes that they are now being treated just as they have treated numerous people on Earth. The tables are turned and these killers are not particularly pleased. But even this potentially intriguing thought is quickly forgotten in a barrage of cliche action phrases and random violent encounters. The violence in the film might please some action fans, but is generally not noteworthy for gore or extreme violence. The grandest fatality occurs when a predator finishes a human with a spinal yank that includes the head. There is also an extended sequence in which Hanzo faces off with a predator in bladed combat. A long shot establishes the action and attempts to be arty, reminiscent of past samurai movies. But this long shot is poorly framed and pretentious, and even though the colors are striking and the conflict absurd, the scene oscillates between silliness and coolness. This vacillation ends up being Predators’ biggest problem. It takes itself seriously, as a throwback to the action films of two decades past, but is never quite garish or exploitative enough to capture the joys of the genre. There are a few too many serious cliches without enough winking nods, and this may lead the viewer to think that the film is pretentious instead of an homage. Either way, there is enough action to satisfy some fans of the genre, and enough camp to generally be enjoyable. This entry was posted in 2 stars, 3 pirate flags, Movie Reviews, P, Pirate Flag Rating, Star Rating on August 20, 2010 by Tim Irwin. I had forgotten about that scene… Definitely one of the most humorous moments, and almost as out of place as Topher Grace or Laurence Fishburne. There are some ridiculous plot holes in this film. 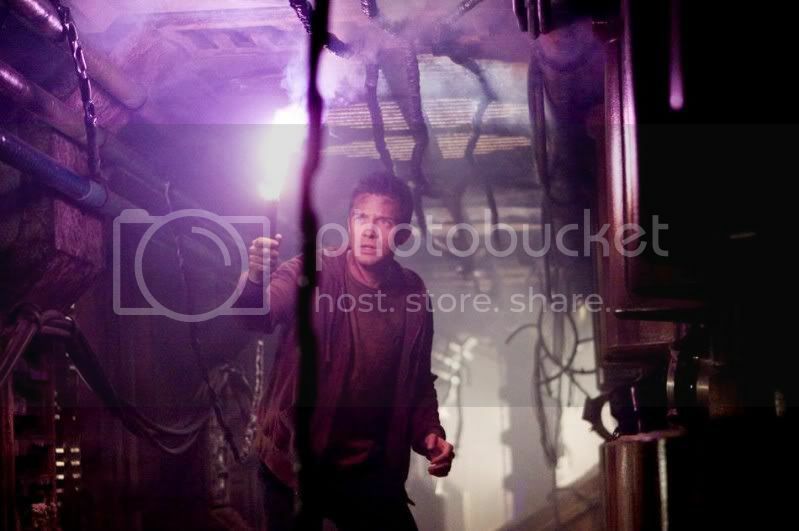 For instance, how did Edwin know so much about alien plant life? Did he just roll this up on his character sheet without GM approval?